Jason Dougenis in Philosophy & Religion on 3 November, 2017. A very common criticism of religion and especially Christianity is that it is not sufficiently progressive on issues of race, gender, sexuality and disability. While there are many cases where this criticism is entirely correct, it is nevertheless an overgeneralisation. It makes little sense to speak of Christianity as a monolith since there are hundreds of denomination active in the UK and over forty thousand worldwide according to the Centre for the Study of Global Christianity . Especially in the UK, organisations such as Inclusive Church have been founded in order to advocate for a more sensitive and progressive stance on such issues so everyone can be welcome in the House of God. 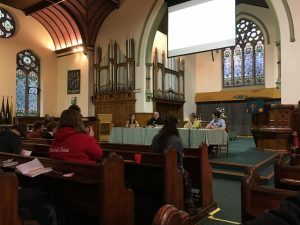 On Saturday I attended a panel discussion in the Elvet Methodist Church hosted by Durham University’s Joint Anglican and Methodist Society (JAM) focused on discussing this challenge facing the Church today. 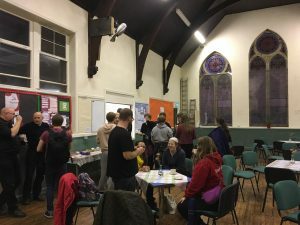 The event’s title was ‘Challenging Stereotypes: Building an Inclusive Church’ and the invited speakers were Reverend Dr Ashley Wilson, who is the North-East’s representative for Inclusive Church as well as the Chaplain of St Chad’s College and Lynne Farquharson from the Northumbria Deaf Mission. 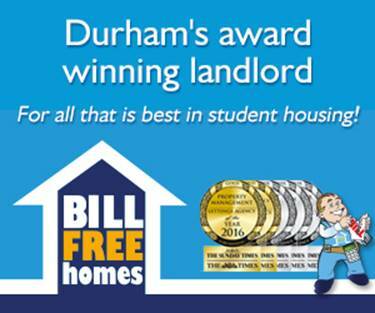 It was also attended by members of the LGBT+ association and the Students with Disabilities Association. Catherine Wickens, a member of JAM was the first one to speak. She argued that every human being is a member of the body of Christ, and just like different organs in a body serve different functions, so must we celebrate diversity because every person has a function and a role to play under God. Following her speech there was a prayer which put emphasis on the diversity of the people attending, setting an example of what a starting prayer would be in a progressive Church. To the question of ‘Why do we need inclusivity’ the answer of Rev Dr Wilson was simply ‘Why not?’ and that was a particularly effective response. How could anyone make a strong a Christian argument against inclusivity considering Christ made everyone on His image, would there be a person that He would like to leave out when His entire time on Earth was devoted to looking after the marginalised in society? The reverend argued that to achieve this goal, priests need to be more willing to listen to personal stories, to go out and find people, especially those who would want to participate but feel unable or unwelcome. However there is one persistent issue with increasing inclusivity and that is when the teachings and scripture themselves are exclusionary, outdated or even harmful. A member of the audience who is a priest shared his story of having to face epilepsy when the New Testament has passages saying that an epileptic child has the ‘devil inside it’ that needs to be expelled. This is a clear example contributing to creating harmful opinions and stereotypes. The reverend was bold enough to call out that specific part of scripture as rubbish. The last part of the discussion was the most powerful one. Participants from the LGBT+ association read anonymous stories of their member’s experience of trying to reconcile their identity with their faith. One of the most moving moments was the story of a Catholic person missing mass because they were coming from a Pride parade and were afraid to enter the Church with a Pride T-shirt. It speaks volumes to the problem of not knowing whether your local place of worship is accepting and how hard it is is for people who have been historically marginalised by the Church, to participate. The speaker also mentioned of the need for LGBT people to love homophobes as the Christian message is to love all people, no matter how hard it might be. Finally, the need for building the Church from strong fundational materials that can withstand storms was emphasised, the message being that an inclusive Church is not only morally right but also more resilient in time. The event was very thought provoking and the speakers did not try to avoid controversial issues, but instead faced them head on and provided unique and interesting responses, while being faithful to the message of Christ. I personally recommend attending further events organise by the Joint Anglican and Methodist society and I am grateful for the invitation I received to cover this event. Important discussions need to continue happening and JAM is defintely a positive force for improving the inclusivity of the Church.